If you're in wholesale distribution, you've got to keep your eyes on five main value drivers: margin, revenue, inventory, cash and expenses. 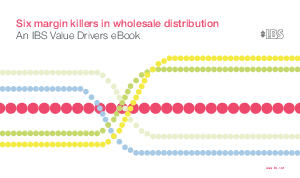 This, the first in a series of eBooks from IBS, the distribution software people, focuses on the first (and arguably most important) driver: gross margin. In it, you'll discover six common 'killers' that erode your margins and undermine your business. Some of them may seem obvious; others are a little more subtle - but we've seen all of them over and over again in every sector: automotive, pharmaceuticals, industrial, food & beverage, medical supplies, paper & packaging and electrical - you name it. We don't want to sound arrogant but it just might be the most important thing you read all year!